Update ~ Permits filed to remove the false wall and restore to full view the mural, Spirit of Harlem, by the end of April 2018. 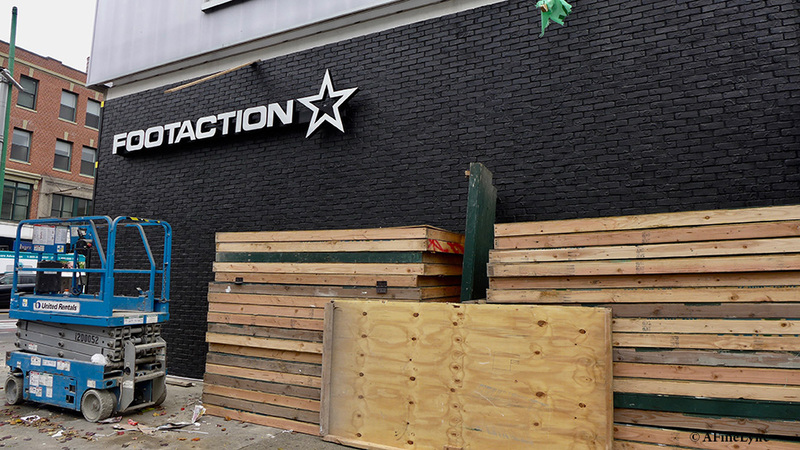 We stopped in on March 27 to see how the work was coming along, and were told that workmen have been on site every day. Shouldn’t be long. 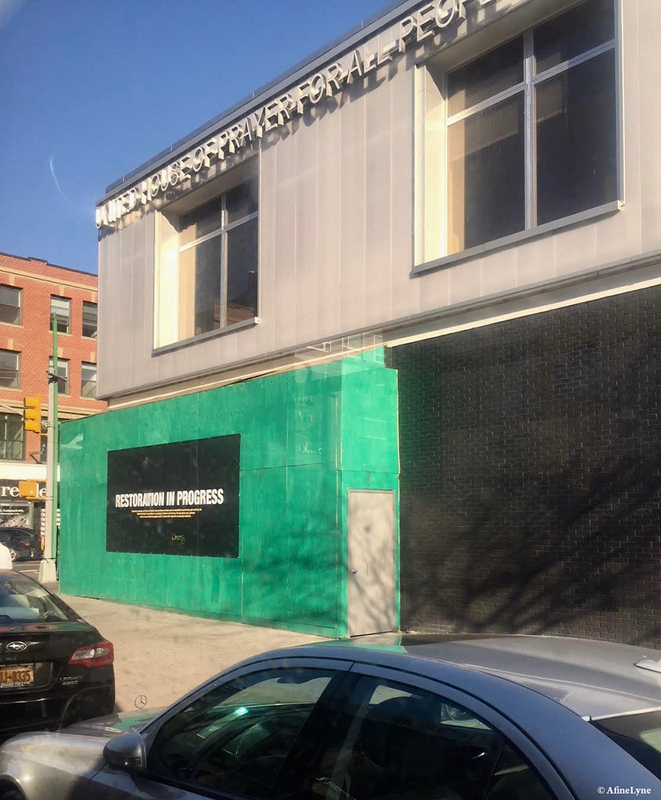 The iconic mural ‘Spirit of Harlem‘ by artist Louis Delsarte was replaced with painted black brick, sporting signage of one of the new shops in the commercial space at 125th Street and Frederick Douglass Boulevard. Follow the timeline below. Your participation in this protest has been helpful in getting a positive response from Foot Locker, Inc. I also spoke to a respresentative of the artist, Louis Delsarte, on the telephone yesterday to confirm what Ms. Signorino wrote. She told me that Mr. Desarte is in contact with Foot Locker and that they have invited him to help restore the mural, but there is no firm date yet. We are getting closer to our demands, but we must stay vigilant. We cannot declare victory until the mural is restored and in full view. It is also an opportunity to remind corporations of their responsibility to respect a community’s culture, history and art. A lesson must be learned that corporate indifference and disrespect, which often comes from gentrification, will be challenged. A better outcome is to work with communities from the beginning; don’t ignore what’s all around you. It’s a beautiful world which can only enhance your business. Please continue to spread the word by forwarding the link below to your friends. Let’s help raise awareness of this problem and let’s keep the pressure on for a quick resolution. 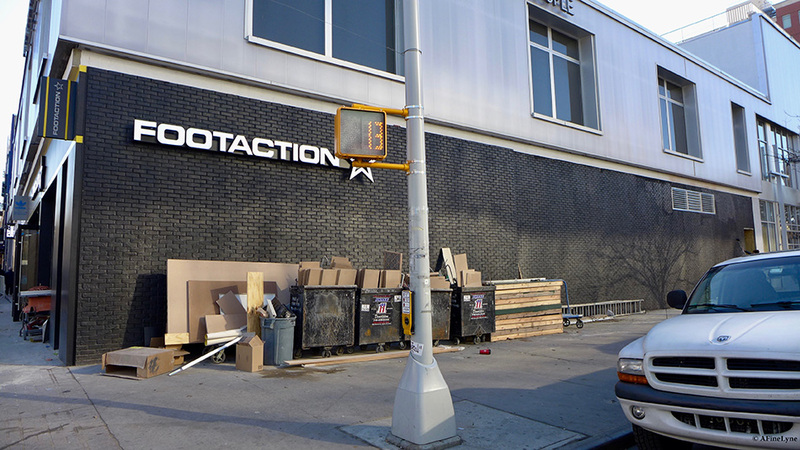 As of February 1st, 2018 Footlocker is still working on the restoration/removal of the false wall. Stay tuned. 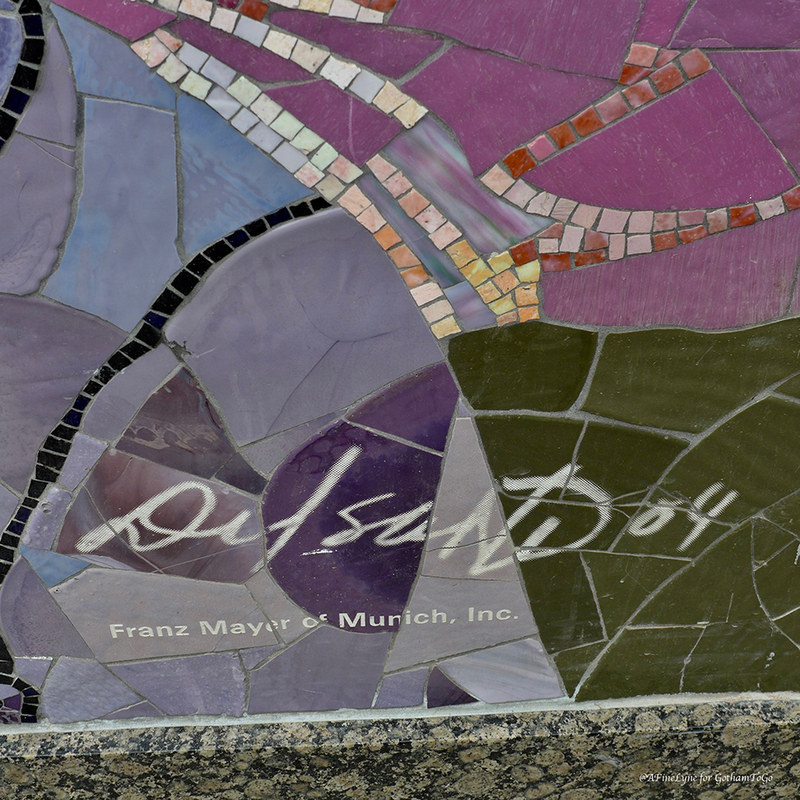 Read more about the covering of the mosaic, and the short and successful agreement to restore the artwork to the community (below). 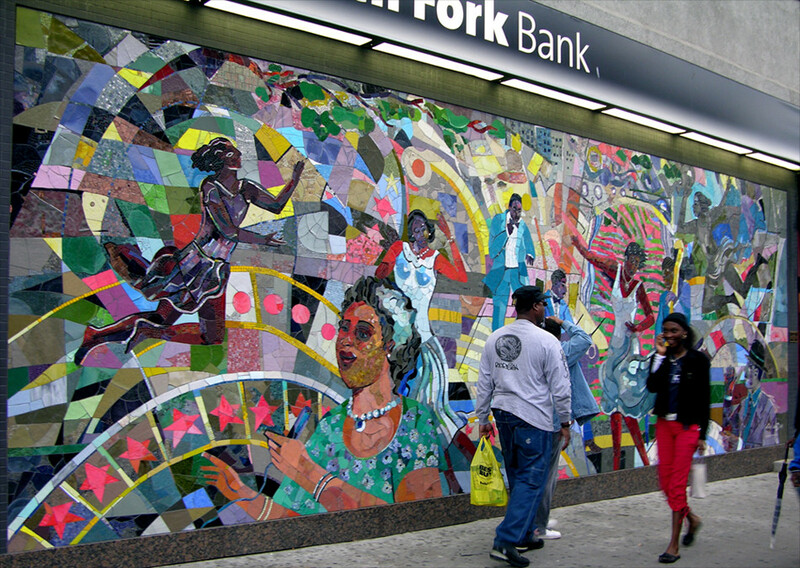 The beloved mural was commissioned by North Fork Bank in 2005, and continued to maintain its place in the community when Capital One Bank moved in. 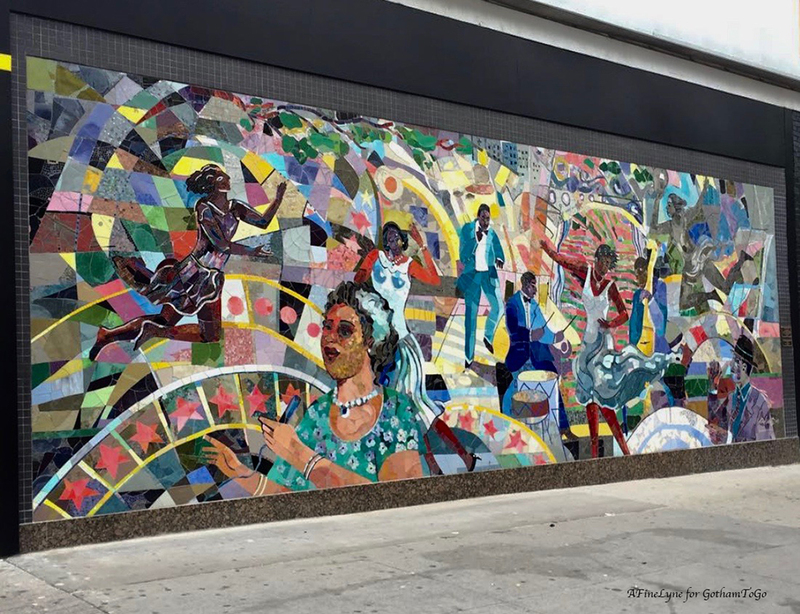 Artist, Louis Delsarte created the ‘Spirit of Harlem’ mosaic as a tribute to to the plethora of artists within the Harlem community. One of the workmen assured us that the mosaic was fully intact underneath the black brick facade. However, reassured – we were not. We hope the next tenant will ~ Tear down that wall. We believe the owner of the property resides on the second floor ~ United House of Prayer for All People, a large and prosperous religious organization and major real estate holder in the area. 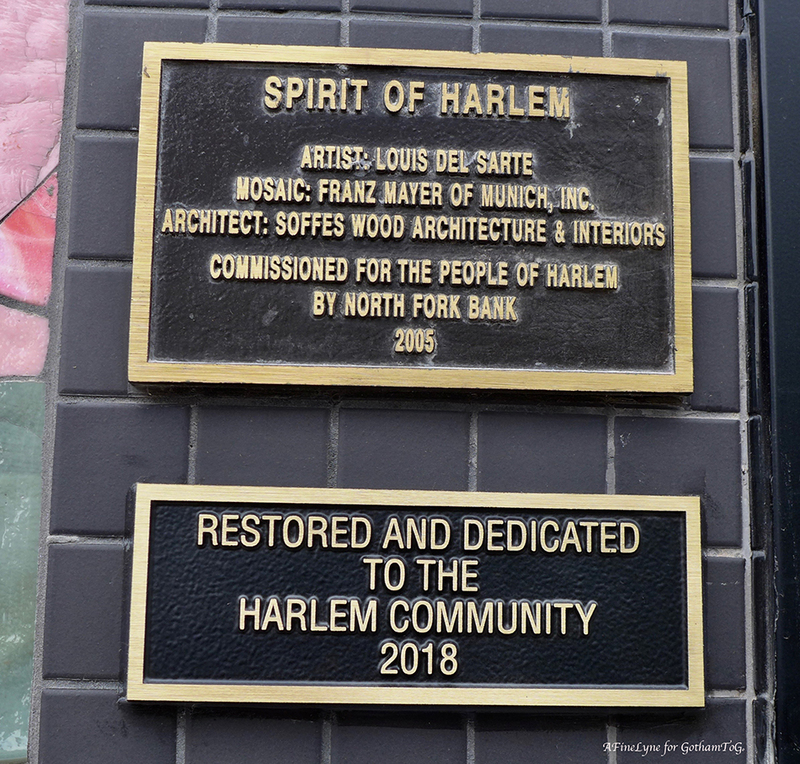 Link to Petition to restore “Spirit of Harlem” initiated by Maira Liriano, Associate Chief Librarian at the Schomburg Center for Research in Black Culture. The National Coalition Against Censorship (NCAC.org), linking to our post above, is monitoring this development, and also linked to petition in the comments section of the above post. 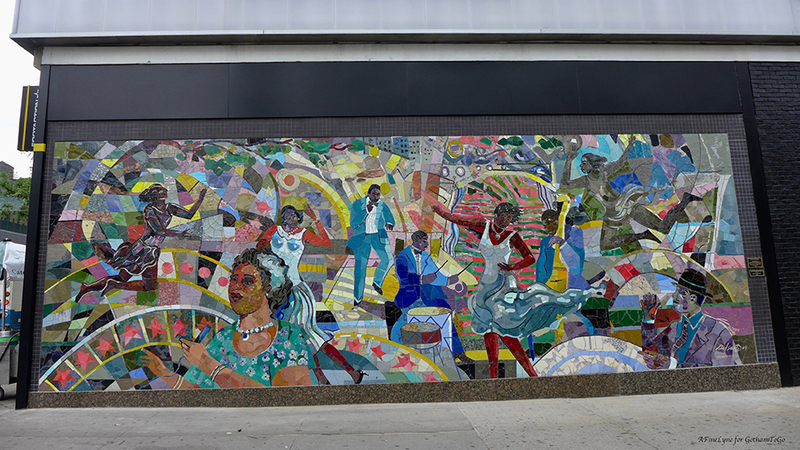 Read about the historic Julien Binford mural, currently under threat, on West 14th Street. On a positive note, read about the new 100 Gates Project in East Harlem, new Taino Towers mural, #Education is Not A Crime (#NotACrime) throughout Harlem, Dizzy’s 100th Birthday mural (part of #NotACrime), the White Park Art Wall, Guerrilla Wall, historic murals of El Barrio, and the historic Harlem Gates of Franco the Great. Save the Date for Spirit of Community at Harlem Hospital, currently on view. Read about three more success-stories this year. This is an abomination!! I am so sick of the ignorance and insensitivity of some people. What makes them think it’s okay to completely cover up a beautiful piece of art that has honored Harlem since 2005. The people of Harlem will be shopping in the new store. The company will benefit from the revenue. Why would they think it’s okay to cover up a tribute to those very same people. The store should be boycotted. There should be an organized effort to avoid the store until they take that wall down. The “wall” has such a negative connotation that the people of Harlem should fully denounce it. Please do not shop there until they take the wall down. We, as a people, actively should not accept this kind of treatment. Show pride for the painting and for your community. Have you signed the Petition. How disrespectful to cover the mural with a faux black wall. We have to boycott these people to show them that arrogance plus ignorance won’t work in our community. Their bottom line is money…gonna keep my money in my wallet. Why they don’t respect and enjoy the art of Harlem???? We want this mural back. I’ve started a petition on Color of Change.org asking Foot Locker to remove the wall and exhibit the mural. Please sign and share. Maira, You will be very pleased to read the update. It is worth mentioning that the mural has been carefully preserved behind the false wall. It is a shame and a disgrace that this beautiful art work has been black-washed! As much as so many things black are disrespected, I am shocked when it occurs once more. 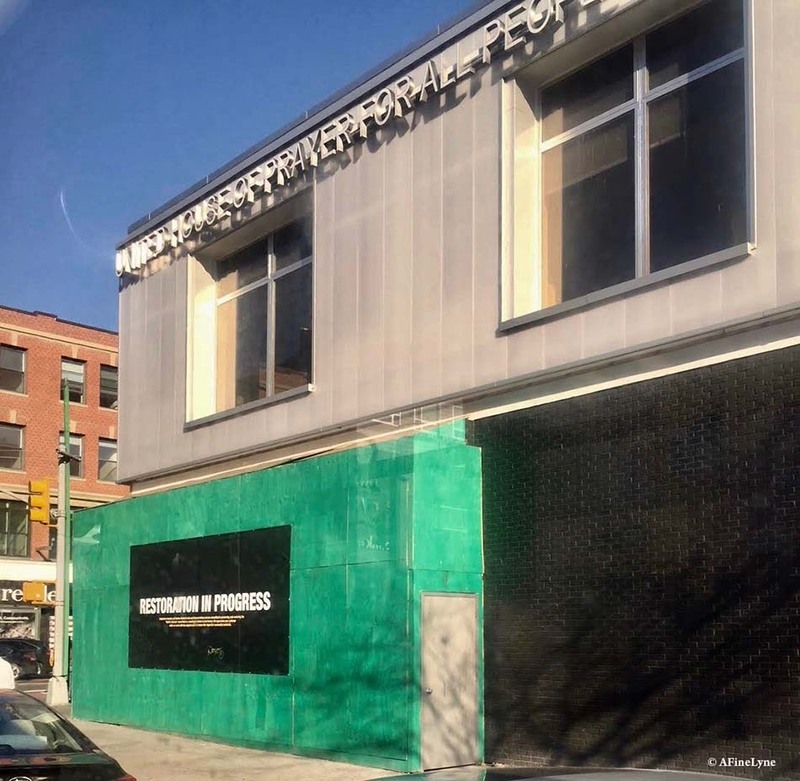 Could the company have asked the neighbors if that mural by well-known artist, Louis Delsarte was something they wanted to remain in Harlem? I think they could have. 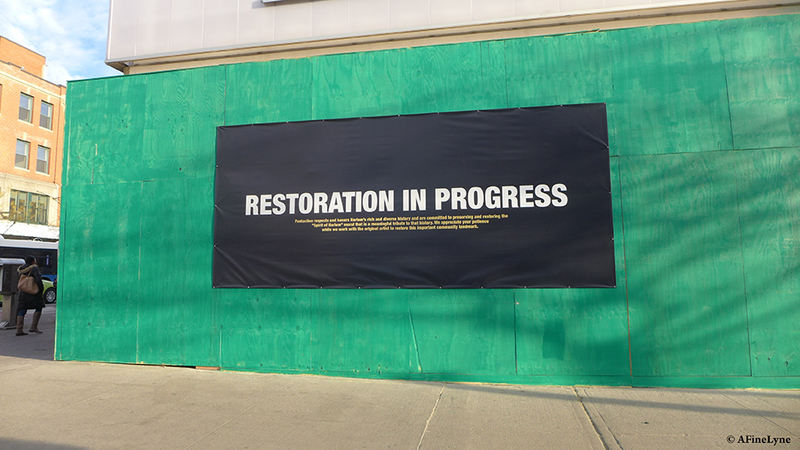 How about restoring it to show your good will, Footaction? Cultural Annihilation and Gentrification. One, and the same thing. That was totally unnecessary to cover it up. 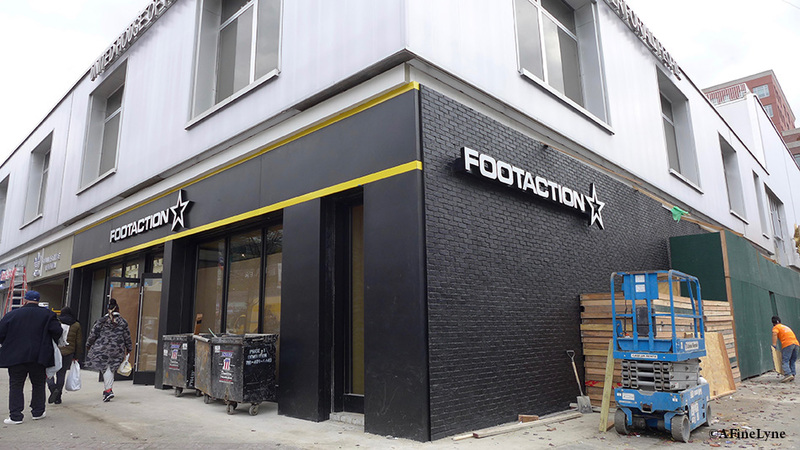 A Footaction sign could have been placed above the mural as a sign the company was conscious of the importance of the mural. Disgusting. But a boycott and demonstration should have occurred before and during the erection of the wall before the damage was done. Heartbreaking. I won’t be shopping there either. This is incredibly sad. One of my absolute favorites in the city. This is so so insulting to the artist and the community. Thank you for the correction to the spelling of my friend’s name. And a big thank you for reporting on this travesty.